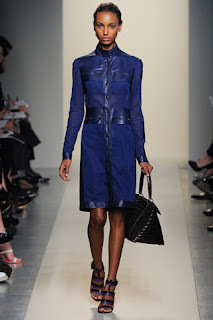 Former aspiring Sports Illustrated swimsuit model Jasmine Tookes emerged as one of the breakthrough faces during the Spring/Summer 2012 collections. 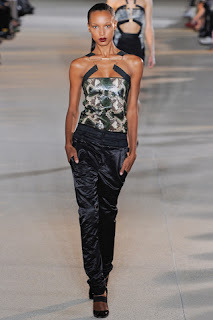 Notching up an impressive 24 show tally which included appearances for Calvin Klein, Vera Wang, Jason Wu, Prada, Versace, Salvatore Ferragamo, Bottega Veneta, Missoni, Nina Ricci, Louis Vuitton, Miu Miu and Balmain, Tookes looked equally impressive on the runway as she does in a bathing suit. The California native made a splash in Sports Illustrated's 2011 online model search competition and has made the seamless transition from commercial to high fashion modelling, thanks in large part to her management team at IMG Models. Wayne Sterling of models.com gives Tookes the nod of approval, listing her as one of the Top Ten Newcomers for the Spring/Summer 2012 season, and makes the astute observation that, "What is the dividing line between 'commercial' and 'editorial?' Whatever it is, Jasmine Tookes blasted past all limitations this season." Tookes has already been marked as a model with mass commercial appeal with campaign appearances for DKNY, the GAP and Abercrombie & Fitch, and was recently photographed by Ellen Von Unwerth for Vogue Italia and by Thierry Le Goues for French Revue des Modes.